BambooHR is a leading online HR software solution created for small and mid-sized businesses. However, if you think this app doesn’t really fit the needs of your company, this article will offer you a wider choice by analyzing 10 alternatives to BambooHR your should consider examining more carefully. We’ll start off by look at the main features and benefits of BambooHR and then move on to a detailed analysis of each of its key competitors and leading HR software systems. Our review team considered BambooHR as the top app in the HR management category and has given it the highest score based on its main functionality, customization, integration and other aspects. Small and growing companies can really benefit by moving up from basic spreadsheets to this advanced Human Resource Information System (HRIS). They can use the solution to manage all elements of their employees’ life cycle and get increased visibility by utilizing metrics such as retention and turnover. The platform also stands out for its comprehensive feature suite that includes all essential HR functions as well as tracking capabilities, employee data modules, and reporting functionality. The vendor offers a great free trial plan if you want to check out the software first. You can easily sign up for BambooHR free trial here. What are the Benefits You can Expect from BambooHR? The app makes it easy to hire and manage employees. It offers excellent onboarding help for new hires. Security is assured as it provides role-based access to information. It takes care of benefits management and performance administration. You can make use of a centralized database to store employee details securely. Finally, you can depend on smart and timely reminders for your schedule and deadlines. If you are not impressed with what BambooHR has to offer, there is no need to go away. Here are viable BamboorHR alternatives that offer useful features of their own. Browse our in-depth reviews on them and you may just find what you need for your company. Zoho People is part of Zoho’s suite of business systems. It is a flexible and simple HR app that you can use to manage employee records. The main advantage is the solution works out of the box and can be implemented easily so you don’t have to worry about customizing it for your needs. The platform is designed to virtually organize HR process and it makes HR workflows simple and fast. Moreover, employees can access the details they need using the self-service portal. Finally, the application simplifies time management operations. If you are looking for a wider choice, here are some good Zoho People alternatives. Why use Zoho People instead of BambooHR? You can easily track and analyze time worked, attendance, leaves, and holidays. Employees and management can use a common avenue for real-time collaboration. The app constantly updates data which helps to eliminate redundancy and boosts accuracy. Finally, you can use webhooks and APIs to integrate the system with third party solutions to create a customizable and scalable HR platform. Why use BambooHR instead of Zoho People? It offers a sleek and modern interface. The app uses a stripped-down mechanism to track performance. You can use the API to expand the key features of the system. The vendor offers reliable support via phone, email, and tickets. Workday is a leading SaaS enterprise-class solution designed to manage global businesses. You can count on the app for features such as payroll, financial management, and human capital management. The app has been created for modern companies and is a good alternative to legacy ERP. For these reasons, it is used by more than 280 companies from medium-sized firms to Fortune 50 giants. The vendor makes profits not by selling software but by offering subscriptions to its range of services. If you are looking for a wider choice, here are some good Workday alternatives. Why use Workday instead of BambooHR? It offers a more extensive feature set compared to BambooHR. The interface is simple and intuitive. The app unifies finance and HR and offers predictive analytics, global visibility, and real-time insights. Essential features include benefits administration, absence management, and automated reconciliation of bank statements. Why use BambooHR instead of Workday? You can integrate it with more than 20 HR and business management systems. The packages are quote-based and tailored for your specific needs. You can view all applications and applicant leads in a separate tab, and select/eliminate applications as they arrive. It is simple to add new job openings with relevant details such as title, salary, duration, contract type, etc. SuccessFactors is a widely used cloud-based HR and talent management application. You can use the system to prepare your employees for business challenges. They can utilize this single system for enhanced collaboration and productivity. Our review team is impressed that this software can be used to assign tasks in a more intelligent manner. Moreover, the pricing is quote-based which means you need to pay only for the features you need. Top features include social collaboration, robust analytics, complete workforce data, global system of record, and integrated suite. If you are looking for a wider choice, here are some good SuccessFactors alternatives. Why use SuccessFactors instead of BambooHR? The app provides onboarding and social business tools. You can utilize its full suite of talent solutions, and core HR and workforce analytics features to improve productivity. Finally, the vendor is committed to cloud-based HR marketing. Why use BambooHR instead of SuccessFactors? You can share job openings on social networks and online job boards. Plus, you can send a special email to new hires that contains training details and gives access to relevant corporate document and system files. New hires can log into the system and participate in discussions, training, and events. You can create employee profiles and insert relevant info in their portfolios. iCIMS is an onboarding and talent acquisition solution that offers a branded career portal and other advanced features. Candidates can use the customizable career portal to find job opportunities. Businesses can utilize this app to simplify and speed up the recruitment process and find good quality candidates. They can use this single system to make quality hires and track key metrics. Notable features include job board posting, career site search engine optimization (SEO), and social media distribution. We are impressed that you can use the iCIMS Social Distribution tool to extend your reach to popular social media networks as well as to more than 300 other social media outlets including specialty and niche sites. If you are looking for a wider choice, here are some good iCIMS Talent Acquisition alternatives. Why use iCIMS Talent Acquisition instead of Bamboor HR? You can perform background screening and assessments easily. Interview management and candidate management is made simple. You can make use of resume search and parsing features. Finally, you can customize your career portal with your own branding elements. Why use BambooHR instead of use iCIMS Talent Acquisition? Administrators and managers can assign competence to other users listed on their dashboard. You can use a single dashboard to manage corporate activities. The centralized database contains the benefits for each employee. Finally, the reports are based on files stored and categorized in the virtual database, and they automatically summarize and consider all applicable taxes. Recruitee offers an intuitive design and you can use it to streamline your hiring operations and manage your employees more efficiently. The app is utilized by more than 600 companies including top brands like Red Bull, Vodafone, Peerby, and Evbox. The notable aspect about its interface is it is fully customizable and brandable. You can create custom pages for each job opening. Another advantage is you don’t need to create job descriptions from scratch as you can make use of a library with more than 200 description templates for different positions. Candidates can apply by either filling the online application form or by linking their LinkedIn or Indeed profile. If you are looking for a wider choice, here are some good Recruitee alternatives. Why use Recruitee instead of BambooHR? It offers four essential tools: applicant tracking, talent sourcing, job promoting, and employer branding. Besides recruitment, you can also use the app to market your company. You can create attractive career sites with the easy-to-use employer branding editor. Finally, you can showcase your company’s culture to impress new candidates. Why use BambooHR instead of Recruitee? You can perform all important operations using a mobile device. Give controlled access based on employee role. Reporting is accurate and insightful. You can avail support through phone and email. Planday is an employee scheduling solution that managers can use to better manage their employees. It enables both employees and managers to work smarter. The app connects them across all devices and helps them easily share work schedules, punch clock, absences, shift swaps and more. It offers a sophisticated payroll export feature as well as a location-specific clock-in tool that enables employees to clock in from any device after starting work. This helps them to calculate the number of hours they work and can get paid for. To sum up, this application simplifies employee schedule management with automation, mobile connectivity, modern templates and more. If you are looking for a wider choice, here are some good Planday alternatives. Why use Planday instead of BambooHR? It adds a unique dynamic to employee schedule management scheme by giving employees autonomy regarding their schedule. You can use the drag-and-drop interface to easily create and change schedules. Plus, you can collaborate with your employees to create a schedule that suits everyone. All payroll and workforce information is stored in one place, enabling managers to spot trends and opportunities and eliminate errors. Why use BambooHR instead of Planday? It offers a handy 7-day free trial. There is also a live demo that shows the features in action. The pricing is quote-based and you need to pay only for what you need. You can contact the support agents via phone, email, and tickets. Zoho Recruit is a cloud-based recruitment platform that offers customizable features to help organizations find the right candidates quickly. Its automated recruitment tools are ideal for small and medium-sized companies as well as staffing agencies and corporate HR units. They can utilize this solution to create and publish job openings, source and reach candidates, manage resumes, and communicate effectively with applicants. Another advantage is this web-based product provides an activity stream that shows all the hiring activities. Key features include website integration, posting to job boards, automated workflow processes, territory management, security administration, social media utilization, and document collaboration. If you are looking for a wider choice, here are some good Zoho Recruit alternatives. Why use Zoho Recruit instead of BambooHR? It offers a free plan for single recruiters and startups. The app provides many applicant tracking and employee management benefits. It makes hiring easier by automating all business-specific recruitment processes. You can customize the app easily for your company’s needs. Why use BambooHR instead of Zoho Recruit? It offers a modern and sleek interface. You can share job openings on online job boards and social networks. Managers and administrators can provide role-based access to users listed on their dashboard. Finally, the app can be smoothly integrated with greater than 20 HR and business management systems. ADP Workforce Now is a web-based HR platform designed specifically for medium-sized businesses. This app automates and collects all of your company’s HR processes into a single dashboard. You can create additional user permissions for your staff members to enable them to manage multiple HR functions. The solution allows you to easily manage your employees’ benefits and holidays, and generate useful reports. The vendor offers online support, video tutorials, and a demo. Top features include benefits management, payroll, talent management, and time and attendance. If you are looking for a wider choice, here are some good ADP Workforce Now alternatives. Why use ADP Workforce Now instead of BambooHR? The app can be accessed on smartphones and tablets. It displays analytics in real time. The platform is cloud-based and you get access to integrated tools and business insights anytime, anywhere. It makes payroll management and tax filing easy. Why use BambooHR instead of ADP Workforce Now? It utilizes a stripped-down mechanism to track performance. The pricing is quote-based and customized for your specific needs. You can send a welcome email to new hires that contains training details and gives access to relevant system files. Finally, you can use a single dashboard to manage corporate activities. Breezy HR is an up-to-date HR management software for both small and large businesses. The vendor has collected all the best practices in HR management and created a solution that helps you streamline employee management. The app is easy to use and can integrate seamlessly with your software infrastructure. The impressive aspect about Breezy HR is it balances great features and price: small businesses get access to all key features at an affordable fixed cost, while large enterprises can avail quote-based pricing based on their needs. Notable features include unlimited candidates and users, team collaboration, and candidate management. If you are looking for a wider choice, here are some good Breezy HR alternatives. Why use Breezy HR instead of BambooHR? It is an intuitive and modern HR management system. The app covers all essential HR needs. It sources talented candidates from LinkedIn and AngelList. 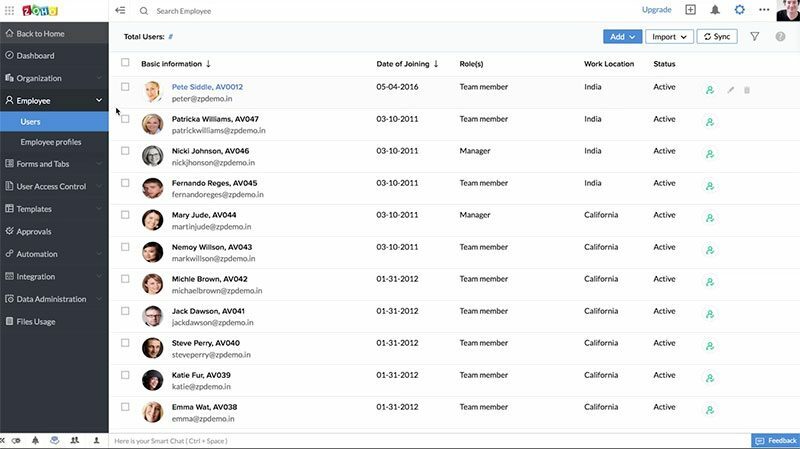 Finally, you can use the solution’s robust drag-and-drop pipeline to manage employees and candidates. Why use BambooHR instead of Breezy HR? You can utilize the API to expand the important features of the system. Plus, you can view all applications in a separate tab and select/eliminate them as they arrive. 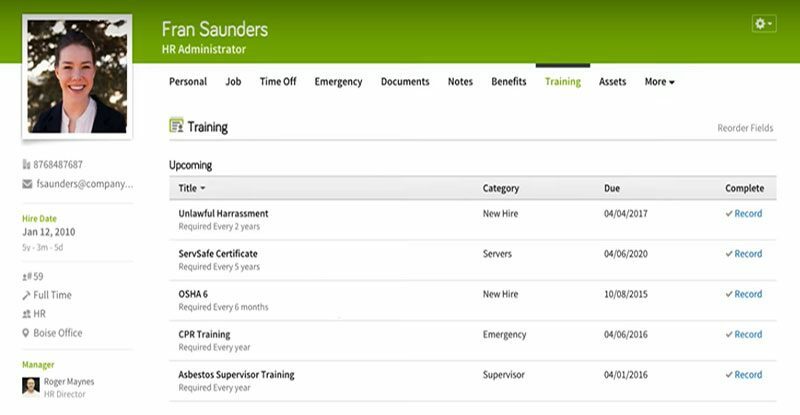 New hires can log into the system and participate in events, training, and discussions. TribePad is a web-based applicant tracking system that offers out-of-the-box functionality for companies. It is designed to help businesses use technology to improve their hiring process, and employee engagement and strategy. Numerous companies are utilizing the app to positively explore their talent pools and maximize their productivity. The system can be accessed on any internet-connected device and helps to organize the employment process. Top features include brand support, HCM, video interviewing, candidate management, and talent management. If you are looking for a wider choice, here are some good TribePad alternatives. Why use TribePad instead of BambooHR? It offers an up-to-date social application tracking system. The feature suite is advanced. You can view a free and private demo before investing your money. Make a list of the features your company needs and the vendor will provide a suitable quote for your budget. Why use BambooHR instead of TribePad? It is easy to add new job openings with relevant details such as title, salary, duration, contract type, etc. You can create employee profiles and add relevant details to their portfolios. The reports are based on files stored and categorized in the virtual database, and they automatically summarize and calculate all applicable taxes. Finally, the vendor offers helpful support via phone, email, and tickets. Intelifi is a robust background screening software developed to help companies, organizations, and property owners among others to run detailed background checks on potential employees, members, and tenants. With Intelifi, users enjoy seamless and unhindered access to a large database that houses more than 400 million unique records, access to over 2,400 sources across 30+ State and Federal regions. The software helps you filter your pool of applicants, prospective members, contractors, partners, and potential property renters and thresh out high-risk individuals by making the background screening process fully automated and optimized based on your criteria. Thorough background checks and screening need not be complicated. Intelifi supplies you with background checks of the highest quality to help you make those critical decisions on hiring, partnerships and renting among others. HireOwl is a hiring and applicant tracking system that allows businesses to connect with university students who are looking for internships and short-term employment. On the other side of the spectrum, university students are able to apply for internships and short-term jobs as well as grow their professional network, gain real-world work experience, and earn money even if they have not yet graduated. With HireOwl, businesses are able to fully engage and utilize a capable and talented workforce without having to hire full-time employees or create long-term positions. Students take these opportunities to augment their capabilities and improve their skills while being able to earn. The software also allows students to turn these simple and short-term jobs to permanent and long-term employment once they graduate.